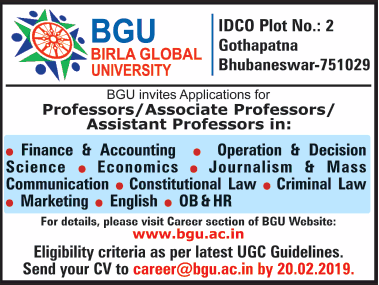 Birla Global University, Bhubaneswar has advertised in THE TIMES OF INDIA newspaper for the recruitment of Teaching Faculty- Professor / Associate Professor / Assistant Professor jobs vacancies. Interested and eligible job aspirants are requested to apply on or before 20th February 2019. Check out further more details below. About University: Birla Global University is a self-financed private unitary University and has been established by the enactment of Birla Global University Odisha Act, 2015 with its main campus spread over an area of nearly 30 acres of land in Gothapatna village under Bhubaneswar city limits. As per the Act the management of the university is carried out by a Board of Governors headed by Smt. Jayshree Mohta, Chairman, Birla Academy of Art & culture being the main promoter of Birla Global University. However, Honorable Governor of Odisha is the Chancellor of the University. Bhubaneswar – 751029, Odisha, India.